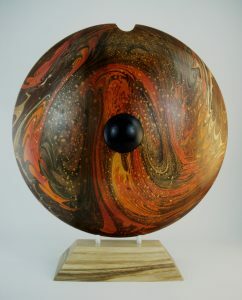 Welcome to Rohr Woodworking where you will find unique wooden art forms. We use select solid hardwoods (maple, cherry, oak, walnut, hickory, etc.) as well as exotic hardwoods from environmental friendly sources. We are dedicated to producing the highest quality product possible. We are confident in our workmanship. In over 45 years of custom woodworking, we have never had an unhappy customer. Currently we are not selling through this website. We sell our products either from phone orders or at Fine Art shows throughout the midwest. We also welcome you to stop by the shop where we would be happy to show you our instock products as well as our manufacturing facility. For custom orders, we welcome your involvement. This site contains a sampling of our artwork in the Gallery tabs. Most of the pieces have been sold but it will give you insight into our artistic style. No two pieces are ever exactly alike. Each piece is hand crafted in our Michigan workshop and we strive for uniqueness. The form on many pieces may be similar but the color and texturing will always vary. Most of our work comes from trees grown locally in Michigan. If you have a tree on your property that has some sentimental value to you and mother nature has taken it down, give us a call. Maybe it was a tree that you built your first tree-house in 40 years ago. Maybe it is a tree from the old homestead and you would like to give it as a gift. We are not a tree service but we do make bowls, vases, platters, etc. out of freshly fallen trees.